By Scott Brown—Don Quixote, written by a washed-up ex-con, lives on after 400 years. By Kurt Zimmerman—The Clemens family library is found at the bottom of a barrel. By Heather Hoffart—The story behind the Sue Barton nursing series. By Nicholas Basbanes—Anything can be anywhere. By Scott Brown—Old Stile Press is more than pretty pictures. By Joel Silver—The more the merrier with extra-illustration. 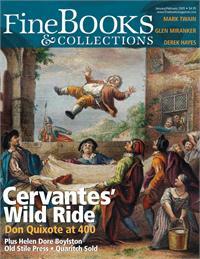 Booksellers doing good; Shakespeare’s secrets; Quaritch sold; a Bibliofind interview; and more. Fine Pick: History of the Book in Canada, plus a Neruda biography.